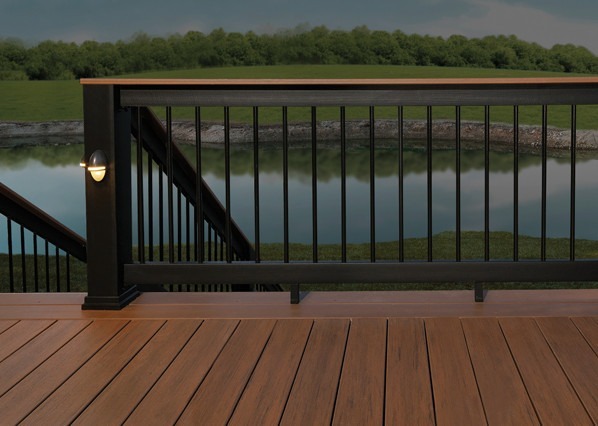 TimberTech Railing in durable capped wood composite or sturdy aluminum is built as strong as TimberTech Decking –and just as stunning. With a variety of colours and profiles to choose from, there’s a style to suit everyone. Choosing a product is easy. Simply select the profile, colour, and infill that fits your style, and you’re one step closer to enjoying your long-lasting, low-maintenance outdoor living space. With a traditional, high-end look, smooth lines, and hidden hardware, RadianceRail is the most popular TimberTech® railing. Customize your timeless outdoor living space when you choose from six classic colours, mix and match posts, rail colours, and infill options. TimberTech’s traditional rail profile offers the most versatile options for colour and infill. Enjoy the look of the most sought-after TimberTech® railing at a value-focused price point with RadianceRail Express. This look, reminiscent of traditional RadianceRail, pairs with 4? x 4? post sleeves and composite balusters for a quick and easy installation with the look and feel of solid painted wood. Offers the railing shape of TimberTech’s RadianceRail at a lower price point. Available in three colour options with composite balusters. For a more modern aesthetic complemented by a sleek, continuous top rail, Evolutions Rail Contemporary offers a linear, high-style look with low-maintenance sensibility. TimberTech’s modern rail profile with a continuous flat top rail is available in three colours and is compatible with all infill options. Post covers in 42? and 8? lengths. Achieve the dramatic look of Evolutions Rail at a value-conscious price point. Evolutions Rail Builder offers clean, flat lines with affordable metal infills. Add a place to set drinks and incorporate colour by topping your rail with TimberTech® deck boards. Available in three colours with glass infill or round metal balusters. Post covers for a 4×4 post in 42? and 8? lengths. TimberTech Impression Rail is an aluminum railing system that gives you the look and feel of high-end wrought iron at an affordable price point with easy installation. It’s lightweight, low maintenance, and leaves the natural beauty of the outdoors unobstructed. Incorporate TimberTech® RadianceRail® top rails and post sleeves for a more custom look.